The purpose of this article is to help you, the homeowner, enjoy a great collaborative experience while working with your landscape designer to create an outside kitchen that fits perfectly in your backyard landscape plan. When designing a kitchen outside, we follow the same design principles as we would for an indoor kitchen. However, outside kitchen design involves logistical decisions in addition to those that focus on aesthetics and functionality. Without the benefit of four walls and a ceiling, there are other factors to consider. 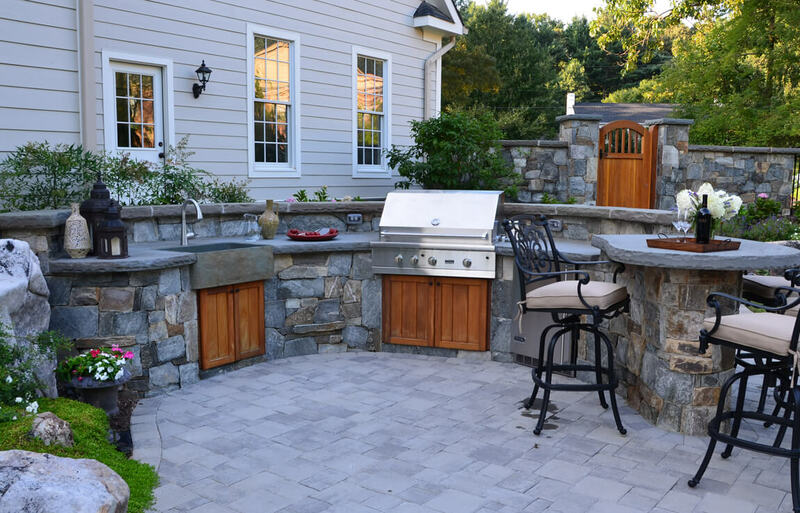 For that, you will need the expertise of a landscape designer to balance those elements of the outdoor environment that will affect your enjoyment of the outdoor kitchen. 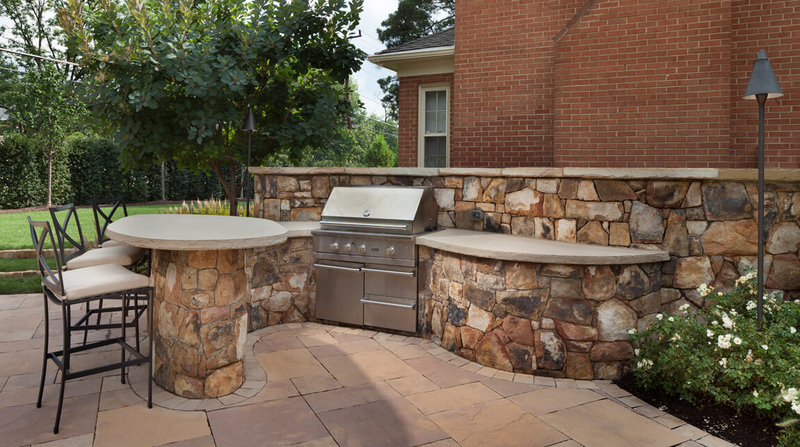 The retaining wall that anchors this patio grilling and dining area provides a rich backdrop for the installation–and it cleverly hides air conditioning equipment. Accessibility & Traffic Patterns. It usually makes sense to have an outside kitchen located near the house for convenience. Even though you may have a sink, fridge, and storage outside, you still have to bring some supplies out from the main kitchen and remove trash when the meal is over. Also, when thinking about entertaining, we want to identify which room of the house will naturally provide access to the outside kitchen/dining area with natural traffic flow back and forth from home interior to patio kitchen and dining spots. Water Supply. To supply water to an outside kitchen, we usually tap into the irrigation system or a hose bib because it is simple and cost-effective. We prefer to install an on-demand water heater (insta-hot) because it easily fits right under the sink. If you want continuous hot water for the outdoor kitchen, we have to bring it from the main inside the house. That’s more involved than is usually necessary. Prevailing Wind Direction. The smell of steaks sizzling on the grill is great, but smoke in your eyes (or inside the house) isn’t. Prevailing wind direction will have a bearing on where you install the grill. Views & Sightlines. Your outdoor kitchen is going to be attractive and visually appealing, but you don’t want it dominating the view when you look out a window. You want to think about what you see from the house when deciding where to place the kitchen. You also want to consider the views that will present to your guests when they are seated or standing at the kitchen counters. Shelter. If possible, we place the kitchen where it will get natural shade from the afternoon sun or from the house itself. If there isn’t enough natural shade, we can make our own. Simply adding a few umbrellas can make the kitchen and dining area a lot more comfortable. Going a step further, a pergola covered with leafy vines can offer wonderful relief from the heat of a summer afternoon. If you want to defy the elements entirely, building an open-air pavilion will keep you and your guests dry in case a surprise rain shower threatens to break up the party. This open-air patio grill station emerges right out of the retaining wall that frames deep planting beds along the backyard lot line. When we talk to a client about designing an outside kitchen, the first question one of our landscape designers will usually ask is: “What’s it for?” We want to understand exactly how you see yourself and your family using an outdoor cooking and dining space. We talk about how the kitchen would fit with other landscape features such as a backyard fire pit or pool patio. We think about the kitchen as one of several outdoor rooms or activity areas that are in relationship to each other: outdoor fireplace, dining patio, bar, spa, lounging area and so on. The next two questions usually are: “How big will it need to be, and, how often do you plan to use it?” Of course, we want to build your outside kitchen to exactly the right size, to exactly suit the needs you anticipate. The way we see it, if we design it just right, you will want to be out there enjoying it frequently — not just once in a great while. It’s important to ask good questions early in the planning stage. The more thorough you are at the outset, the less likely it is that you will be surprised or disappointed later due to an oversight. The most important thing to us, whatever you decide to do, is that you get out there and enjoy it as often as possible. We do not want to over design and overbuild the project if your needs are simple. On the other hand, if we are going all out to create an outdoor kitchen and dining area to accommodate large gatherings, let’s make sure we don’t forget anything. You may want to include a split-level counter in the design to provide bar seating for guests who want to talk to the chefs while they work their magic. Keep in mind that all of these kitchen task areas must relate well to each other regarding proximity and ease of movement from one task area to the next. The accent lighting around this farmhouse style stone sink features wall mounted electrical fixtures and bar top lamps. Although the needs are the same, lighting an open-air kitchen can be tricky. Once again, the lack of four walls and a ceiling forces your designer to get creative. For task lighting, lights built into the backsplash are a great solution. For ambient lighting, we can usually fix spotlights on the house or a nearby tree that focus down on an area. We wire those lights to a switch near the grill area so that they are easily controlled. Also, a lot of the newer grills have built-in lights, so when you lift the hood, you can see inside. Many newer grills come with a rotisserie, so you will need at least one outlet on the backsplash and another below the counter for the refrigerator. It’s good to place a spare outlet on the side of the countertop for convenience. 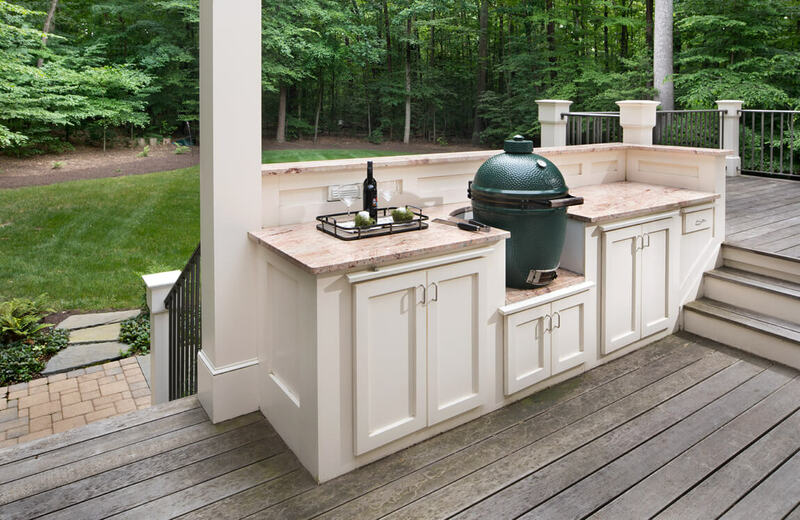 This kitchen area features a “Big Green Egg” ceramic cooker. Because the area is protected by a roof, we’ve used wood cabinetry. Let’s face it. Your outside kitchen is designed around the grill. Gas, electric, or wood-fired? You have choices. The size and type of grill you choose will determine the size and layout of the rest of the kitchen. Here are some Surrounds recommended manufacturers. None are perfect, but all are well made and reliable. We’ll advise you on which one will be best suited to your installation. Here you can keep it simple or indulge in deluxe. Think realistically about the type of appliances and accessories you will need. Aside from the grill, how much food and beverage storage will you need? Will you need a sink and faucet? This backyard patio kitchen features custom built wood cabinet doors, bluestone slab countertops, and a farm-style stone sink. 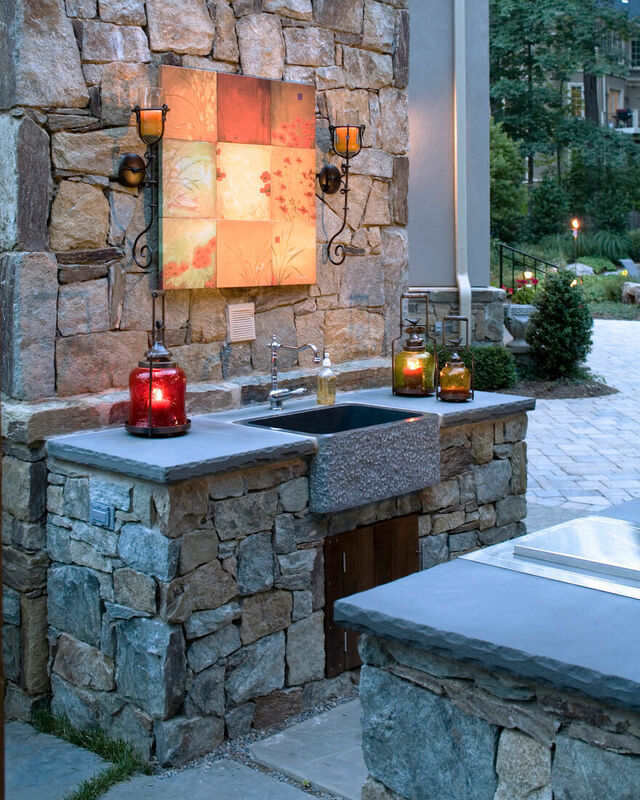 The choices you make about the type and number of amenities will determine the size of your outdoor kitchen. There are a lot of tempting accessories available for improving your kitchen, and you could spend a lot of money on them. But think about what you will need and use on a regular basis. If you don’t need a refrigerator and sink, don’t invest in them. Go with a simple built-in grill and bar counter seating. Countertops. It is important that you choose stain-resistant materials. We favor stone because it allows us to pick up on the aesthetic of the main house and hardscaping. Some varieties of stone are highly porous and vulnerable to spills even after they have been sealed. Be aware of that when you make your selections. Typically, we use Pennsylvania or Tennessee flagstone for countertops because that’s what we use for the patios. Although flagstone blends in beautifully with the landscaping, some people feel it is a bit rough to the touch. If that’s the case, we’ll substitute polished granite. Your landscape designer can help you make the best choice based on style, maintenance requirements, and cost. Sinks. We prefer boulder sinks. Stone Forest, an Arizona company, makes a variety of garden accessories including sinks that are carved from solid granite. The sinks are fabricated from whole boulders that are cut in half, hollowed out, and polished on the inside. They blend in naturally outdoors. Drop-in type stone sinks or farm style stone sinks are best because they integrate well with the thick (2”) stone countertops. It’s hard to get a 2-inch slab to work with an under-mount sink because it has to be cut close to the front edge of the counter. A drop-in type stone sink works naturally and beautifully. They are more expensive but worth it. Cabinetry. We recommend that you choose cabinetry that is made from stainless steel or stone because these materials tend to last longer outdoors. Many of the grill manufacturers listed above carry outdoor cabinetry. Danver offers a line of custom stainless and powder-coated options, as well. A better approach sometimes is to have our craftsmen use masonry to fabricate the cabinet enclosures on site. This eliminates the long lead time associated with cabinetry orders. We can create a one-off cabinetry design just for you finished with custom wooden door panels. Not Enough Food Preparation Area. This is the most common oversight. Be sure to plan enough counter space for prepping, cooking, serving and clean up. In particular, the grill and the sink areas always need counter space to the left and the right. Not Enough Light. Without ceilings or walls to affix light fixtures, effectively lighting an outside kitchen can be a challenge. A good landscape designer will think it through and make sure there is enough task lighting to illuminate work surfaces for evening entertaining. This petite grilling and dining patio is nestled right into the landscaping. Since it is out in the open, we installed a generously sized umbrella for shade. Your outside kitchen and dining area will often share the stage with other activity areas in your outdoor living space, and there needs to be a logical connection between them. Your landscape designer will make sure that there is a balanced flow between those separate but connected areas of your outdoor living space. 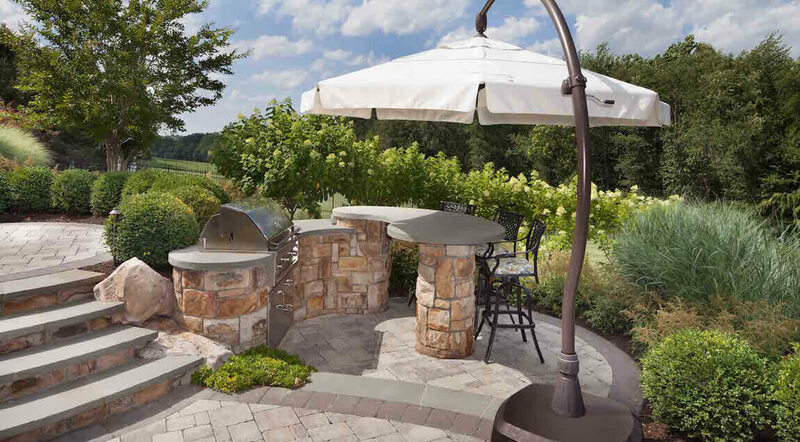 If you are considering adding an outdoor kitchen to jazz up the entertainment potential in your backyard patio, we hope we’ve given you the information you need to choose the right landscape designer to guide you through the project successfully. 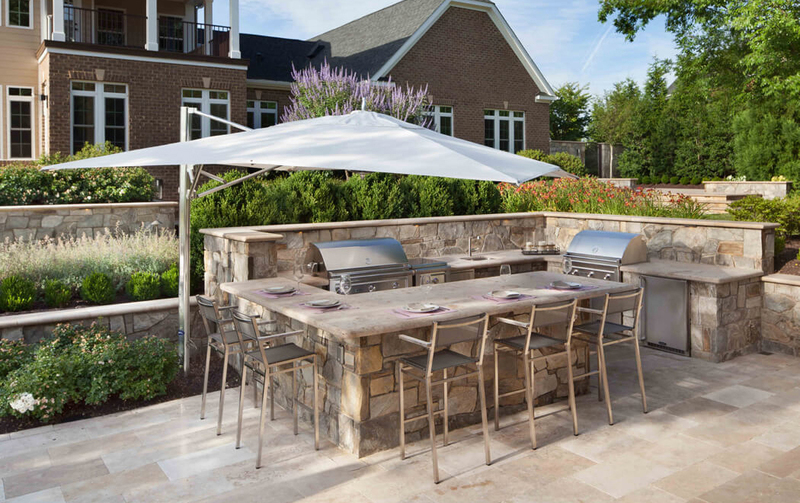 An outdoor cooking and dining environment can be as simple as a built-in grill station or as deluxe as a fully equipped outdoor kitchen with dining pavilion. And there you have it: everything you need to know about outside kitchens based on conversations our landscape architects have had with homeowners just like you. 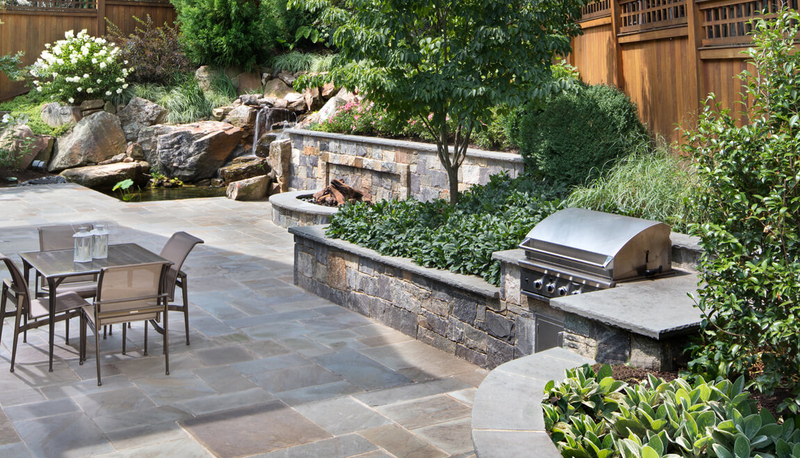 If you’d like to talk about creating cooking, dining and entertaining spaces in your backyard, feel free to contact one of our landscape designers to schedule an appointment.